+ FREE downloadable practice sheets! Hey there! Welcome back for another tutorial. Today you are going to learn how to do faux (fake) calligraphy step by step! SO, WHAT IS FAUX (FAKE) CALLIGRAPHY? Faux calligraphy is a technique of using any kind of pen to imitate the look of calligraphy, hence the name. Let me give you a bit of context so you have a better understanding of the topic. As we already said several times in our previous articles, calligraphy is the art of beautiful writing and it is performed with specific tools for it. Faux calligraphy is simply a fun and easy way of imitating the look of these specific tools. On top of that faux calligraphy is an AWESOME way for learning the very basic letter structures. – don’t worry later on you will be able to practice along with the step-by-step instructions. One of the benefits of this technique is that you can do it with literally any writing tool! However, i will give you a quick list of materials in order for you to be able to follow this tutorial and practice along with it. The reason we have also the pencil on the list is simply for the guidelines that we are going to create. Guidelines are a great way to keep your work straight and on a consistent angle, it takes you very little time to make a few guidelines, yet they will help you a lot! HOW DO FAUX CALLIGRAPHY – STEP BY STEP! Ok, so now we know what faux calligraphy is, how it differs from calligraphy itself and we also know what we need in order to create it. Now it’s time to get our tools out and start practicing! Before the step by step process let me give you a quick example of how faux calligraphy work along with a few quick notes. Keep your letters consistent, size, angle etc. Try to keep the weight on the downstrokes somewhat consistent. You don’t need to go crazy with precision but keep an eye on that – check the image below. Ok now we got this out of the way we can proceed with the full step by step process! Quick note – i always recommend getting the rolling ruler, it’s a really helpful tool when it comes to drawing your guidelines quickly. Take your time don’t rush it! Remember what we said about lifting your strokes and dividing the letter in smaller strokes. Step 3 – Now that we have our foundation laid out on the paper lets identify our downstrokes! Step 4 – Now we can start adding the weight to our downstrokes! I always add the weights on the inside of my strokes. For example you can see that the downstroke on the l was added from the left side while the downstroke on the m is added on the right side. I just find this way to be much better then trying to add the downstroke on every side of every letter. Step 5 – fill the downstrokes! This shouldn’t be too hard, just don’t rush it! Once the ink is dry (let’s avoid those smudges) feel free to delete the pencil guidelines that you made. 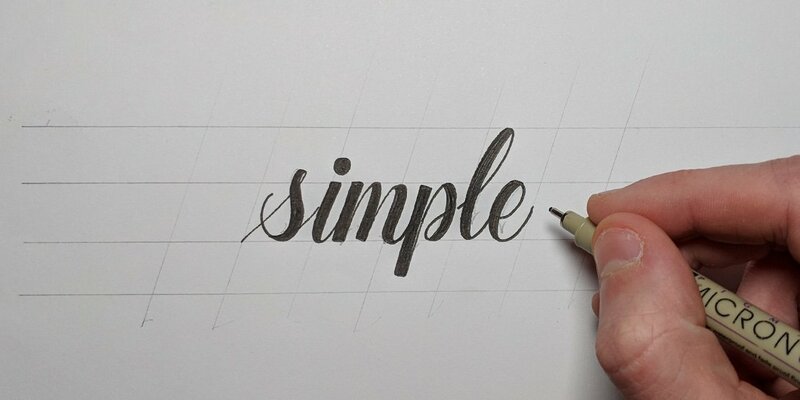 After a bit of practice you should start quickly understand where to add the thick downstrokes without even thinking! With the free downloadable practice sheets you will be able to practice ALL the letters from the alphabet. At the end of the practice sheets you will have a lettering grid laid out for you to try and practice your first word. Once you’ve tried to do it on your own be sure to take a photo and post it in our official Facebook group so we can give you some feedback and help you improve further down the line. Don’t worry we just send emails when we publish a new tutorial or if we have some major updates – we hate spammers as well! If you are a beginner keep it simple! Focus on understanding the fundamentals and try to expand from that. This will give you a much more organized workflow and you will achieve better results in less time! Practice is key, and if you are not willing to devote your time to it, then it’s pretty much pointless to have any big expectations. Be sure to join our Facebook group where you can get constructive feedback on your work, share experience and network with other lettering and calligraphy artists! As always, if you have any questions or comments you are always more than welcome to contact us. Hi,I’m a beginner at calligraphy,and I find your instructions very helpful,thank you! The content it’s amazing, It’ll be very helpful to keep me in the Calligraphy-Lettering world. My question is, I’m registered already but I can’t find the way to download the practice sheets, where can I find them? Hi, I’m very new at calligraphy, I’m wanting to write my own place cards and invitations for my wedding later this year. I don’t quite understand how to draw the guidelines. Is there a starting rule on how far apart the lines should be or the angle or any of it? Hey Sandee! Traditional calligraphy scripts such as italic, copperplate, blackletter etc. have determined heights, angles etc. depending on the size of the tool that you use. However, modern calligraphy and faux calligraphy as well, has more freedom to it. That been said, you can determine the height and the angle that you want, so if you want to have straight and tall letters that’s totally fine, if you want them short and really slanted that can work as well. If you are still in doubt i would highly suggest that you do some work and that you share it in our Facebook group so we can closely monitor your progress, and provide you with further tips and suggestions on how to improve 🙂 For any other questions, feel free to reach out at any time! I am a beginner and find your tips and instructions very helpful. Thank you! Thank you so much for this & very helpful! Especially adding the space/weights inside your strokes. I’ve been struggling trying to keep consistent thickness for some letters & struggle to get that thicker downstroke in a tight spot. Your way is brilliant & I tried as I was reading. Problem solved! brilliant! Thank you, thank you! Hi! I just started to learn hand lettering and your website is very helpful for beginners like me. Already subsribed and download my first practice sheet. Thanks!